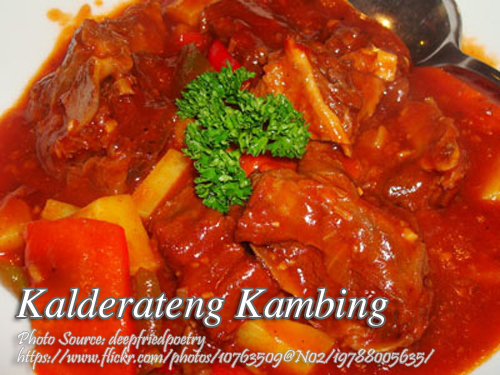 Kaldereteng kambing is basically goat meat stew in tomato sauce added with cheese and liver spread. Preparing the goat meat is very different from other red meat like beef or pork because you have to remove or eliminate the gamey or musky odor and flavor of the meat. There are different ways also to prepare the goat meat and some use vinegar and spices but the recipe I have use sherry to remove the musky odor and a more flavorful dish. If you can’t get sherry, you can use dry white wine as as substitute. Compared to other kaldereta, kalderetang kambing is more special and served in special occasions. It is also perfect as an appetizer or pulutan, a perfect combination of beer. Marinate meat in ¼ cup sherry for at least 1 hour. In a heavy frying pan over medium fire, heat ¼ cup of the oil until slightly smokey, then brown meat slightly. Remove from pan and set aside. In a thick, medium pot with lid over low fire, heat the rest of the olive oil. Saute garlic until light brown. Add tomatoes and simmer for 5 minutes then add tomato sauce and simmer another 5 minutes. Stir mixture every 2-3 minutes to prevent burning. Add meat to tomato mixture and simmer for 5 minutes. Add water or broth and simmer another 10 minutes. Add liver spread, pimiento, olives and cheese and simmer until meat is tender. If the mixture is too thick, add more broth or water. Season with hot sauce and salt to taste. Add remaining 2 tbsp sherry and simmer for 1 minute. Adjust seasonings to taste. Where did the goat meat go? The goat meat? its in the kaldereta dish. Please read the recipe again.